The Enviro Image Solutions Blanket Renewal Program is the only service of its kind. No one in the world has been able to recreate a process that allows a once spent blanket to be reused on press for as long as a new blanket without sacrificing quality. Because our Blanket Renewal Program is so unique, most printers have questions about the program. Here are some of the frequently asked questions and if your question hasn’t been answered please email us. Q. Do you work with barred blankets? Q. Do you rebar the blankets? No. We do not remove the bars nor do we rebar the blankets. Q. Do you resurface or grind the blankets? No. We do not resurface or compromise the surface with any grinding. We perform a multi-stage process that corrects the release characteristics of the blanket to be the same as when it was a new blanket. Q. Do you only renew UV blankets? No. We can renew many types of blankets, including conventional, hybrid and UV blankets. If you send us a sample of all the blankets types that you frequently use, then we will evaluate them and judge their potential success in the renewal program. Q. Is blanket renewal limited to any particular brand? No. We renew all blanket series and brands. Q. Can you fix blanket smashes? Yes, provided the surface of the blanket is not torn or broken. Please see In-depth on Smashes for more information. Q. What do I have to buy to make this work? Nothing. Simply keep your spent blankets, treat them carefully as new when removing, tape the corners, and send them to us. Q. How do you renew the blankets to be able to work on press multiple times over? Our process is proprietary. However, we can tell you that it is a multi-stage award winning process that took over 3 years to develop. We basically restore the working properties of the effected blanket. Q. How do I know that this is really going to work? The proof is in the printing. That’s why we offer to renew your first ten spent blankets for free and recommend that you test the print results of the renewed blankets against that of new blankets. Q. How can I test a renewed blanket directly vs a new blanket? Choose a medium to longer run job. Make-ready the job with new blankets and begin printing. Once the job is stable and it is completely settled (typically around the half way mark), remove the new blankets, install the renewed blankets and compare the printing results. Because a renew blanket doesn’t look new it is important to perform an unbiased test and judge it on performance rather than its visual characteristics. More information on our Recommended Testing Method. Q. What do I do before installing the blankets? As with a new blanket, we recommend that once the renewed blanket is installed that the printing surface be hand wiped with water first and then a blanket wash be applied. Never pick through the transport cell to select those blankets that look good based on visual appearance. This will damage the other blankets and the abrasions will negatively impact the next operator who may accidentally install a damaged blanket. Q. Do the renewed blankets look new? The renewed blankets may or may not retain a tattoo in their blanket wells. This tattoo is below any contact surface and will not have any impact on the performance of the blankets. Up to 70% of your annual blanket costs. We aim to renew your blankets at roughly one-third of the cost of new blankets. Check out our savings calculator for an estimate of your monthly and annual savings. With each order, we estimate and communicate the number of pounds of rubber and fabric that are spared from the landfill and the dollar savings to you. Note: Dollar savings and environmental impact calculated provided by the savings calculator is an estimate based on average blanket costs, expected blanket usage per press and other assumptions. Actual customers’ savings may be different (higher or lower) than the estimates provided and such differences may be material. Q. How long does it take to renew a blanket? Every printer is different and it depends on how long it takes for you to use the blankets. Our custom built transport cells hold up to 125 blankets: if it takes you 3 months to save up that many spent blankets, then we work on rotating two groups of blankets within that time period. Accordingly, as you use the first group of renewed blankets, then the second group is collected and sent to EIS for renewal. The second group will be returned to you before you have used your previous order of renewed blankets to ensure that you always have blankets available for use. Q. How do I pack the blue transport cell? Tape the sharp metal edges on the blankets. This helps prevent damages from bar abrasions to the printing surface of the blanket. Stack blankets neatly by setting them down in an up-and-down motion (and not tossing them) and fill the transport cell before shipping. Please take extra special care to ensure that the metal bar doesn’t drag across the rubber surface as this will result in a substantial reduction in savings. Blankets coming off the press should be treated with the same care by all handlers as when they were first installed. Blankets are now multiple use items so please treat the spent blankets as if they were new. Q. Can you renew the blankets more than once? Yes. On average, each blanket is renewed four times. However, we have been successful at renewing the same blanket up to 12 times! Q. What do you do with damaged blankets that can no longer be renewed? Blankets that do not pass our quality inspection process and cannot be reused on press are broken down into their components and recycled. The rubber and fabric is used as alternative solid fuel in the manufacture of Portland cement. We are also experimenting with other applications for the waste material, such as track and field surfaces, asphalt, and oil and gas applications. Q. Do I get billed for recycled blankets? No. We only return and charge you for the blankets that have passed our quality inspection process and can be reused on press. We pay a fee to recycle those blankets that have been damaged and cannot be reused on press. As such, our interests are aligned and our goal is to work with you to increase your renewal success rate and your savings. Q. Can I send you blankets to be recycled only? It costs us a lot of money to recycle blankets that can no longer be used on press. Blanket recycling is a service that we perform to do our part for the environment. However, if you are not an EIS customer, then we can recycle your blankets for a fee. Q. Do you recommend any particular blanket brand? Although we get this question A LOT, we do not currently recommend any particular brand over another. However, our experience in working with printing blankets from around the globe has given us valuable insight into what we would like to see be developed as a premium world class blanket. Q. How do I ship volumes of blankets to you without damaging the blankets? During the test phase, we ask that you tape the corners of the blankets (to prevent bar end abrasions) and carefully place your spent blankets in the container that they arrived in. Send them to us and we will renew them at no charge. After you have tested the renewed blankets and you are convinced that they print as good as new, then we provide you with a transport cell that safely stores and collects up to 125 blankets. Q. What about shipping costs? You pay to ship your spent blankets to EIS. We pay to ship the renewed blankets back to you provided that the transport cell was full when shipped to EIS. We use FedEx freight LTL for shipments in excess of 150 pounds to the United States and we pay less than $500 to deliver a full transport cell, which weighs approximately 450 pounds, from Vancouver to the south-east corner of the United States. We have customers in the USA, Canada and Japan that have saved over 70% of annual blanket costs with shipping included. Q. If I send you 125 blankets, will I get 125 blankets back? Not necessarily. There will always be a learning curve during the process. The test phase normally has a 60% success rate. Thereafter, the first order typically has a 70% success rate, meaning that approximately 35 of the 125 blankets will not be returned due to damages. However, repeat customers tend to increase their renewal success rate to 90%. That’s why we call it a program. Once the program is fully implemented, renewed blankets will always be available and your purchase of new blankets will be significantly reduced. Q. What are the primary reasons for the blanket damages? Believe it or not, but more than 40% of all damages are caused by mishandling. That is why we require that you always treat the blankets as if they were new. See Proper Blanket Handling. Q. I have other issues with my blankets that shorten their useful life. Pin-holes? Picture framing? Blistering? Smashes? No problem. As part of our program, we analyze the unique protocols within your facility by studying your blankets to understand the types of issues that cause your blankets to fail our final stamp of approval. We perform this analysis as part of our program and the results often surprise printers. The biggest losses arise in areas that were previously believed to be unimportant and “big issues” often have a far lesser impact. We communicate these findings to you after each order together with recommendations on how to increase your savings. Consequently, these recommendations extend the life of your new and renewed blankets, reduce direct blanket costs, reduce the hidden printing costs, increase production efficiency and reduce landfill waste. See Improve Productivity. Q. Can you track how many times the blankets have been renewed? Yes. We treat each blanket like a unique asset. Each blanket is stamped and the number of times that it has been though the renewed process is recorded and communicated to interested customers. Q. How are the savings on the savings calculator calculated? We have estimated the number of blankets that each press would consume at 100% capacity. Additionally, we estimated the average cost per blanket based on the majority of your printing presses. Note that these costs are estimates and actual results may vary. Such differences may be material. Q. Could I calculate my actual savings based on actual costs? Yes. Please provide us with the number of blankets that you consume per press, including the cost per blanket and we will calculate your annual and monthly estimated savings. Q. What are the biggest challenges? Press crews are often resistant to losing the privilege of always using new blankets. However, once they are won over with the performance of the renewed blankets, saving and treating each blanket like new becomes second nature to the printing process. Using the EIS program, press crews everywhere are leading the way to save money and keep the blankets out of the landfill. Q. What are the benefits for the printer? Q. What’s in it for me? We have heard great stories. Some companies pay incentives to pressman and press crews to save money. You could try to negotiate a fee or a percentage of savings (profit share) for incorporating the program into the facility. Recently, when a CEO of one of our customers was asked by a consultant “how do you address the exorbitant money spent on new blankets”, he responded “I don’t know, let’s go to our press supervisor and find out” and when the CEO saw the blue transport cell, and realized that his press room supervisor had taken it upon himself to implement the EIS blanket renewal program this supervisor was made employee of the year! 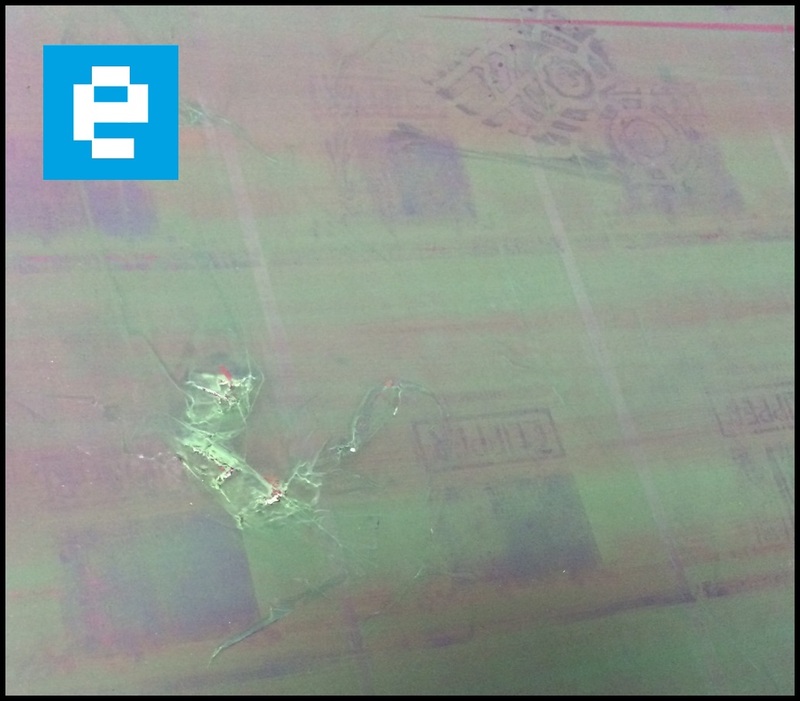 Paper smashes commonly occur among conventional printers as bad paper travels through the press. To Enviro Image Solutions, paper smashes are either, Type #1 (repairable) or Type #2 (not repairable). Type #2 smashes are generally very severe and the rubber surface is typically broken. Blankets with Type #2 smashes are not recoverable with our proprietary blanket renewal process as we do not grind or resurface in any way. Type #1 smashes are repairable as the rubber is unbroken but still has a low spot or dent from the paper hit. We have multiple processing techniques and routinely repair Type #1 smashes. Sucker smashes are not a common issue with most print shops and generally happen with new or inexperienced feeder men. The severity of the sucker smash determines if we can repair the blanket for reuse on press and the same rules apply to sucker smashes as paper smashes; if the rubber has broken, then it is not repairable by Enviro Image Solutions. Ink smash usually occur when globs of ink fall into the running press causing a round smash and usually fractures the rubber. These smashes typically occur when excessive ink build up falls off in chunks from the impression cylinders or if the print unit crossbars/ink fountain are in need of maintenance. However, Enviro Image Solutions considers these types of smashes preventable. As a general rule, we recommend that that you examine and frequently clean your crossbars, cylinders and other areas where ink build up can dislodge and fall into the running press. A method to reduce the amount of ink build and lower downtime for clean up each shift is to cut your packings to a length and width shorter than the substrate, especially on longer runs. Over-trimming your packings is generally a very good policy as there are many other side benefits from this practice, including reducing the amount of ink build up that occurs on the impression cylinder, reducing maintenance on your press, improving image transfer, improving ink-water balance, reducing paper waste with each stop and start of the press, etc. and can lower overall blanket usage. Cutting packings is not a good solution or even possible with certain printers though. To find out more on this and other customized recommendations that can work for your company, send us 10 blankets to participate in our Free Trial to prove the quality of our service and renewed blankets. As part of our free trial we will send you a Pressroom Diagnostic Report to help make your company become more efficient and lower your overall blanket consumption. For more info please contact us. 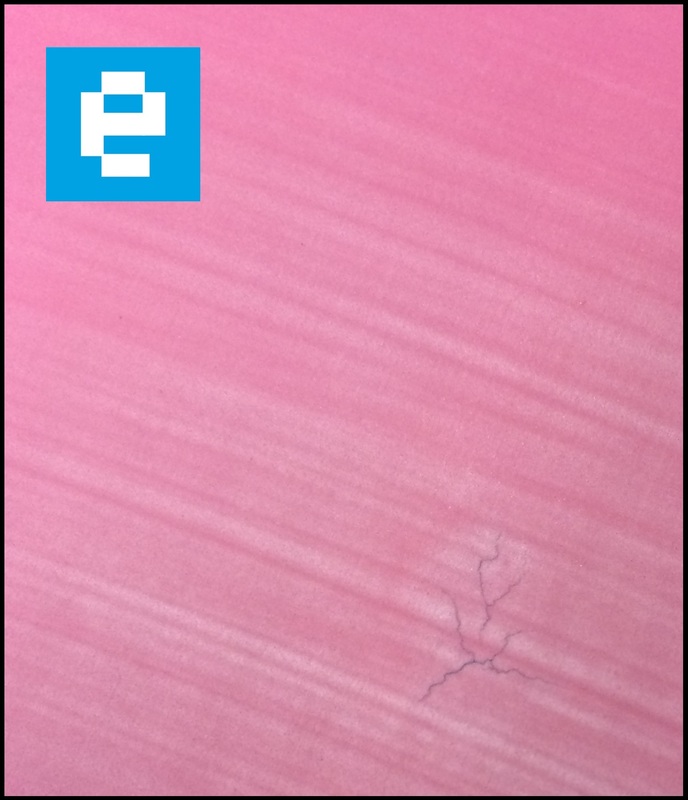 Type #2 smash – A glob of ink that makes a round indent in the rubber often causing fracture lines in the rubber surface and is not repairable by EIS.